Wow, it's been a crazy couple of days thanks to the 2018 Nordstrom Anniversary Sale, and it's only the beginning! Public Access hasn't even started and things are flying off the shelves... literally. I'm hoping for lots of restocks for those of you waiting to shop on Friday - there is so much great merch to be had. Today I'm sharing SIX of my favorite purchases (so far). For all of my purchases click HERE. Similar tortoise sunglasses you'll love on sale here and here (splurge)! 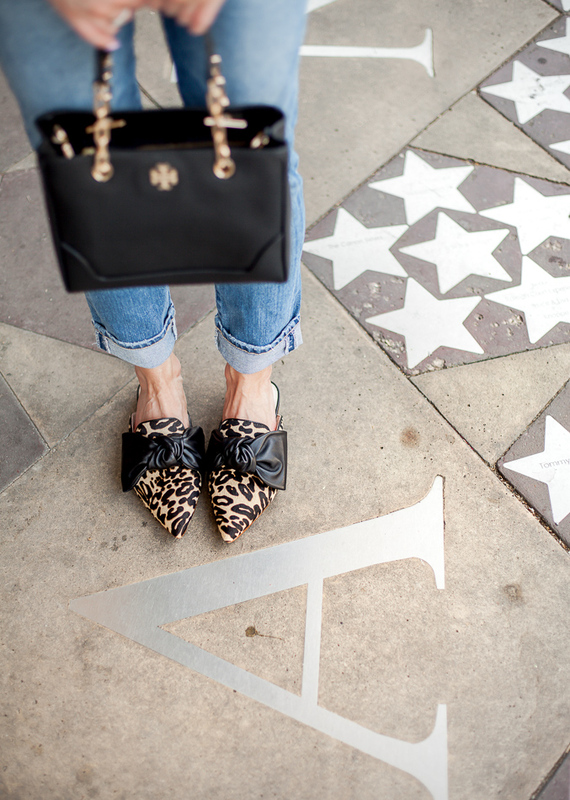 One // You can probably already tell my pre-fall wardrobe consists of neutrals, basics, and pops of leopard print... and I wouldn't have it any other way. 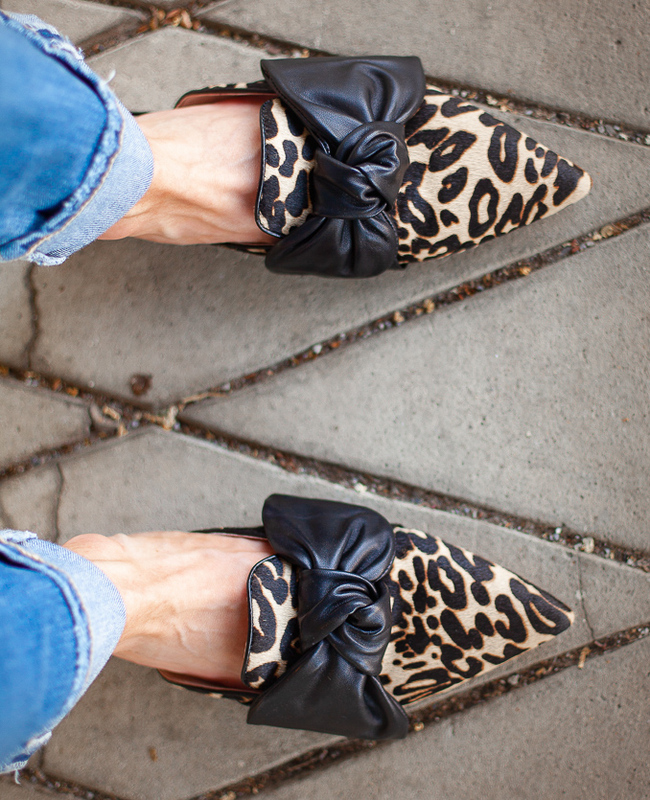 I literally cannot say enough good things about these genuine calf hair bow slides. They were the number one item on my shopping list when the anniversary sale started and I was overjoyed when they fit AND were comfortable. My photographer and I walked around taking these photos and my feet felt great (and they actually stay on your feet). The quality of this brand is amazing and the detailing is very well thought out. Two thumbs up and true to size! 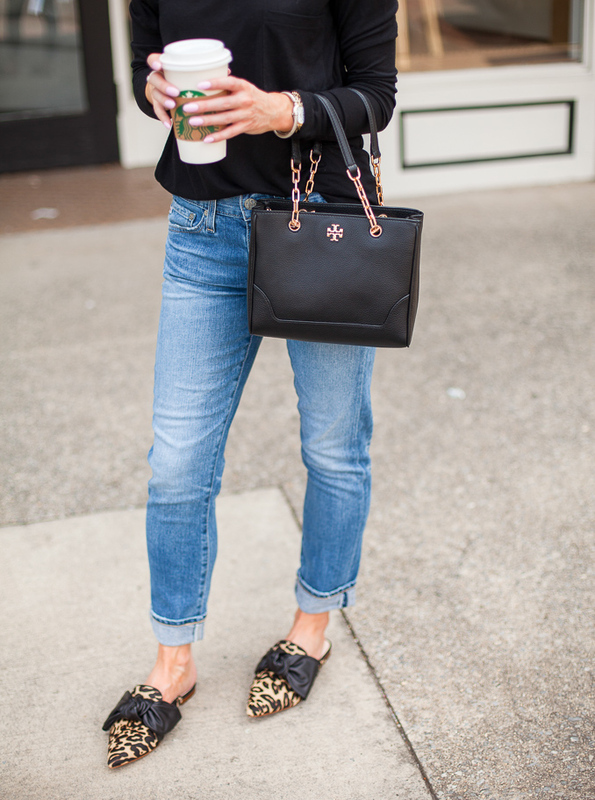 Two // My ex-boyfriend relaxed slim jeans are another sale obsession. 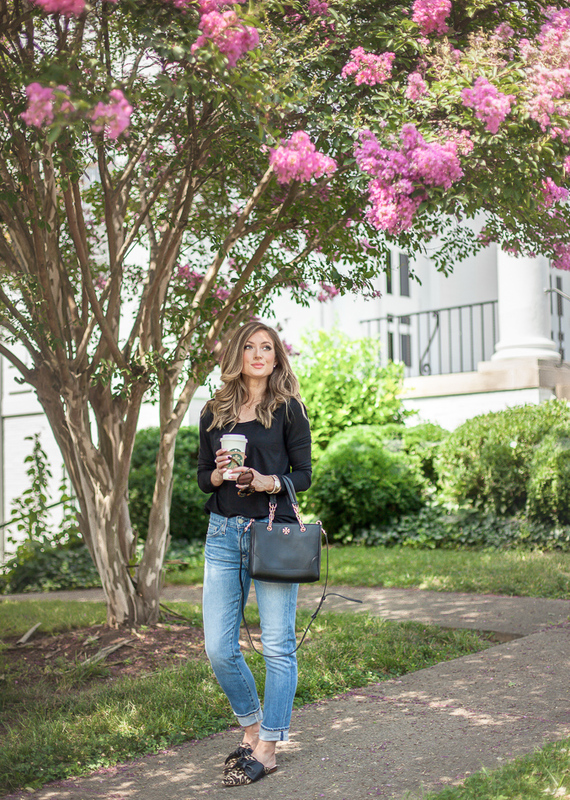 I purchased these jeans during last year's sale in the distressed version and fell head over heels in love. The fit is quite perfect (I recommend sizing down. I'm wearing a 23.) and the quality superb - I can say this because I own several jeans by this brand and all wash and wear well for years, making it well worth your money. They are a bit of a denim splurge but now's the time to buy because you get a nice little discount - you won't regret it! Four // My fourth favorite is this black long sleeve tee. A lot of the pictures online don't do the items justice and when I saw it I didn't think I needed it. Fortunately, they had my size in the store so I tried it on and didn't want to take it off. It's less than $19 and super soft and lightweight which makes it the best transitional item for late summer to fall. Always good to have something like this on hand even in the midst of summer at night when it gets chilly. I also bought it in white (and sized down to an xxs)! Five // It's sort of hard to see in the photos but one of the pieces I've been wearing nonstop since I got it is this initial "a" necklace. I love that the letter is lowercase which is different from anything else I own, and it layers perfectly with the rest of my collection. It's super affordable and dainty enough to wear all of the time (even to work). FYI last year's initial necklace sold out and it was super hard to get ahold of after. Six // And lastly (well okay maybe there's one last item below), my diamond cubic zirconia earrings. I officially own three pairs of these earrings in the 1ct, 2ct, and 6 ct. They are literally perfect for everyday wear and look as good as the real thing (plus you don't have to cry if one gets lost since you won't break the bank when you buy). My mom liked mine so much she also ordered a pair (oh, also the bf jeans too!). Highly recommend wearing with MagicBax as they help support the earrings so they don't droop (especially the larger studs). They work miracles! So I had to add one last favorite (not pictured) because I want you to snag it before it sells out, and things are selling out so fast! I picked up a faux fur leopard print coat because I love the print and needed some new outerwear for fall/winter and OH. EM. GEE. is it fantastic. I haven't seen anyone else share it and its amazing! So so soft, true to size, and under $80. Make sure to check it out for yourself! Make sure to check out my Nordstrom Anniversary Sale 2018 Guide for all of my posts thus far like Five Items I Bought Selling Out Fast and 15 Things I Want (or now have lol). OH! And for all of my purchases from the 2018 Nordstrom Anniversary Sale (with sizing info.) go to my sale drop-down menu at the top left of the page! I also included items from all different categories like tops, bottoms, beauty, and home decor. 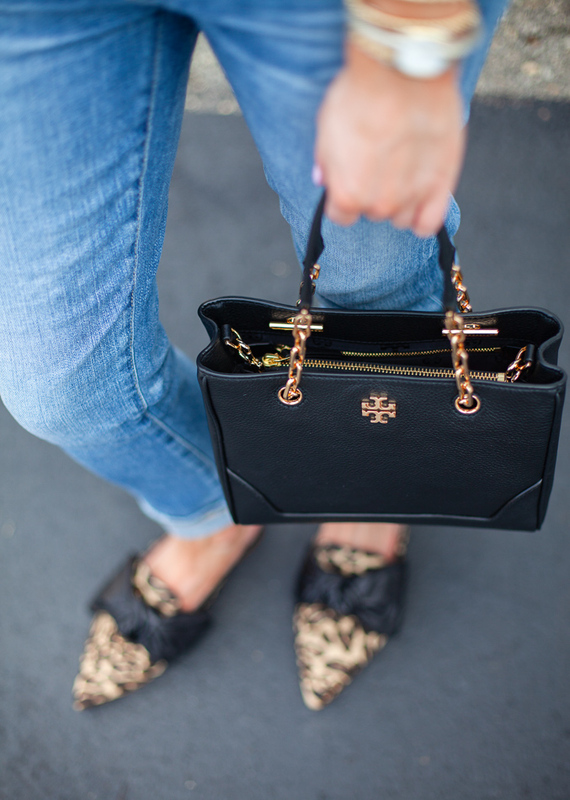 You can also enter to win a $500 Nordstrom Gift Card in FRIDAY'S BLOG POST!